October 18, 2016 – As the ExoMars Schiaparelli module descends onto Mars on October 19, it will capture 15 images of the approaching surface. Scientists have simulated the view we can expect to see from the descent camera. Schiaparelli separated from its mothership, the Trace Gas Orbiter, on October 16 and the two spacecraft have been traveling separately toward Mars ever since. Now, the TGO is preparing to enter orbit around the Red Planet, while Schiaparelli descends to the Martian surface. Its descent will take just under six minutes, using a heatshield, parachute, thrusters and a crushable structure for the landing. Its role is to capture 15 black and white images during the descent that will be used to help reconstruct the module’s trajectory and its motion, as well giving context information for the final touchdown site. 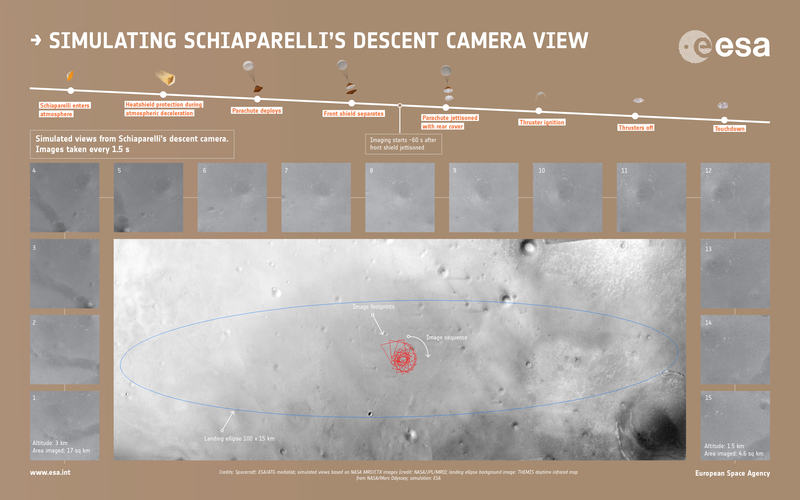 The wide, 60º field-of-view will deliver a broad look at the landscape below, to maximize the chances of seeing features that will help pinpoint the landing site and reveal Schiaparelli’s attitude and position during descent. The camera will start taking images around a minute after Schiaparelli’s front shield is jettisoned, when the module is predicted to be about 3 km above the surface. This will result in images covering about 17 sq km on the surface. The images will be taken at 1.5 second intervals, ending at an altitude of about 1.5 km, covering an area of roughly 4.6 sq km. Schiaparelli will target the center of a 100 km x 15 km landing ellipse, in a relatively flat area in Meridiani Planum, close to the equator in the southern hemisphere. This region has been imaged extensively from orbit, including by ESA’s Mars Express and NASA’s Mars Reconnaissance Orbiter. To plan for analyzing Schiaparelli’s descent, thousands of simulations were made varying the atmospheric conditions and the flight path to the surface. From one such simulation, which touched down at the center of the landing ellipse, simulated images were then made using data from NASA’s orbiter covering the Meridiani region, as shown here. In reality, the altitudes at which images are taken may vary somewhat, depending on the atmospheric conditions, the final path through the atmosphere and the speed at which Schiaparelli descends. The real images taken on October 19 will be stored in Schiaparelli’s memory before being beamed up to the Mars Reconnaissance Orbiter, built by Lockheed Martin Space Systems, and downlinked to Earth on October 20. ExoMars is a cooperative project between ESA and Roscosmos. It comprises two missions: the Trace Gas Orbiter and the Schiaparelli entry, descent and landing demonstrator module, which were launched on March 14, 2016, and the ExoMars rover and surface platform, scheduled for launch in 2020. The first of the real images taken by DECA during Schiaparelli’s descent to the surface on October 19, are expected to be presented during a press briefing on the morning of October 20, along with other information confirming the status of the lander, and published on ESA web channels. This is a visualisation of the ExoMars Schiaparelli module entering and descending through the atmosphere to land on Mars. The animation follows a simulated timeline of the module, starting when it enters the atmosphere at an altitude of 121 km at 14:42 GMT. In six minutes it will use a heatshield, parachute and thrusters to brake from 21 000 km/h to a near standstill 2 m above the surface, where a crushable structure on its underside will absorb the final shock. The times indicated in the animation are onboard spacecraft times at Mars. The one-way signal travel time on October 19 is just under 10 minutes, meaning that signals relayed by spacecraft at Mars are received on Earth about 10 minutes after the event itself has happened on the Red Planet. Watch a series of live webcasts from ESA’s ESOC mission control centre, Darmstadt, Germany from Wednesday, October 19, 2016 9:40 a.m. MDT — Thursday, October 20, 2016 4:00 a.m. MDT.